Food! We all love food, some of us live to eat, some of us eat to live. But either way, we all have a love/hate relationship with food. I am not a huge foodie and I am not at all fussy, give me my roti/dal, a couple of veggie dishes (especially if spinach is one of them) and I’m happy. 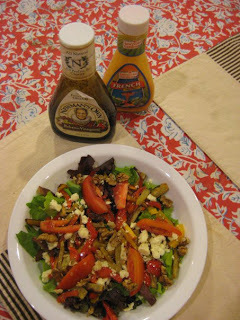 All I ask is that the veggies be organic and fresh! But where I live getting my hand on organic vegetables is almost impossible, so I have been settling for the next best thing – fresh vegetables from the local vendor around the corner. I make sure I buy them when his truckload arrives around 9am in the morning, so at least if not organic, its fresh! So imagine my horror when I found out that the vegetables in the local market are grown with 700 times the allowed pesticides that can be used. 700!!! Not 5 or 10, but 700!!! Yes, so along with my cauliflower curry I have been eating Cypermethrin, the okra fry I love is laced with Monocrotophos, Palak Panir is accompanied by Malathion and Diazinon…..apples, oranges and grapes are not exempt either and are known to have residues of Aldrin and Chlordane, 2 deadly pesticides! There is irrefutable evidence to show that these residual pesticides can lead to all kinds of health problems including cancer, kidney and neurological diseases. This is when my husband and I decided to take matters into our own hands and grow our own vegetables. We researched soil, we learned about pest free gardening, we went into the backyard and peered at the ground to see what creepy crawlies were living there, we poked, we prodded, we bought fertilizer, we bought manure, we bought organic pesticides, we got rid of our gardener whose mantra was spray, spray, spray…..and while we were in the midst of all this we chanced upon the whole concept of HYDROPONICS! 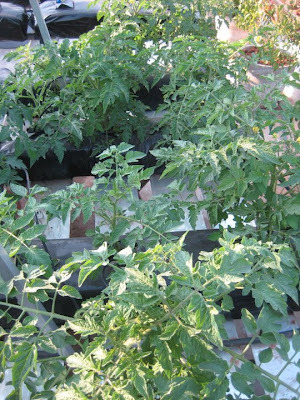 I won’t go into too much detail, you can read about it here, but basically it is growing vegetables without soil, but only in water, where the plants are anchored in vermiculite or rock wool. Pests live in soil, so by default no soil = no pests! Pretty simple. 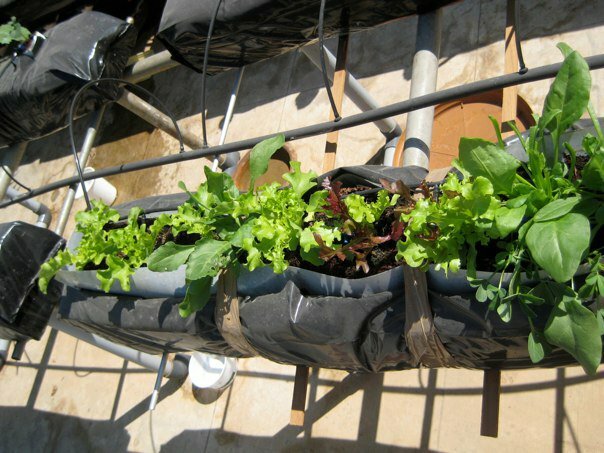 Of course, reading about it was one thing, actually starting our own hydroponic garden was quite another. No one had heard of it here in Hyderabad. So some more reading and googling and we found a vendor in Tamil Nadu who was selling bags of coco peat. Coco peat is just pure and simple ground up coconut husks and have the appearance and texture of soil, but none of the mineral content. So it mimics all the characteristics of soil without the problems associated with soil. (A little side note here about my husband…..he’s the left brained engineer type, so nothing he does is ever without a whole lot of research and study and discussion and total concentration…and then he jumps into the project headlong and gives it his all!! No multi tasking like us women!!). So it would only be fair to say that this gardening project is entirely his baby, my only contribution was suggestions as to what vegetables to plant. 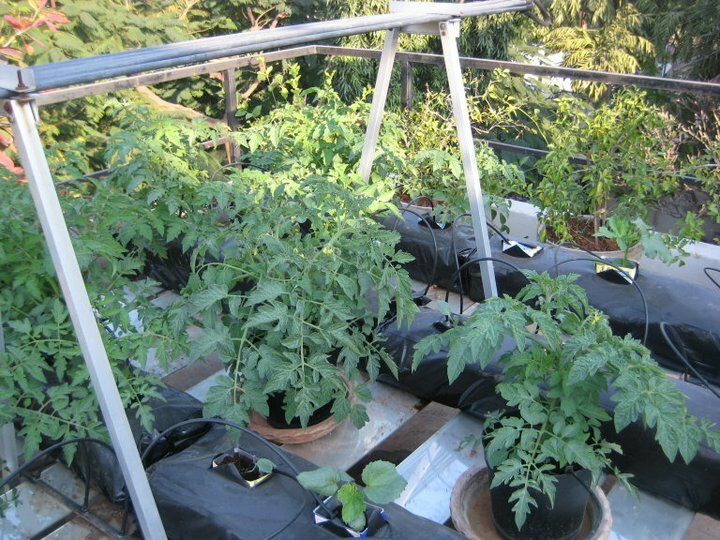 Hydroponics can be as simple as growing a single plant in hand watered bucket or as high tech as being fully automated, monitored and controlled with your cell phone!!! 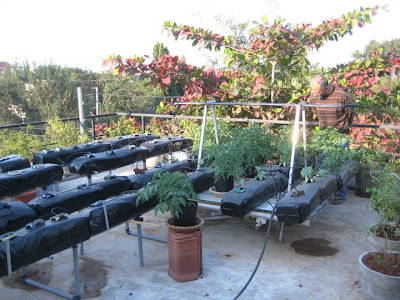 The average home hydroponic set up has a growing medium in trays, a reservoir/tank to hold the nutrients, a submersible pump and drip irrigation tubing for ease of watering, a simple timer and an air pump to oxygenate the nutrient solution. Of course light, natural or artificial is also required. Since we were almost out of space in the backyard, we decided to set up shop on our rooftop terrace. So this is basically our set-up! The 4′ long x 8″ wide bags of coco peat came in flat bales which swelled up once we wet them with water. Each bag went from being an inch high to 8″ high. Then 3 or 4 “X’s” are slit on top of each, into which the seedling is planted. If you are scattering seeds for veggies like spinach and lettuce, you can make a long rectangular cut out and scatter the seeds. 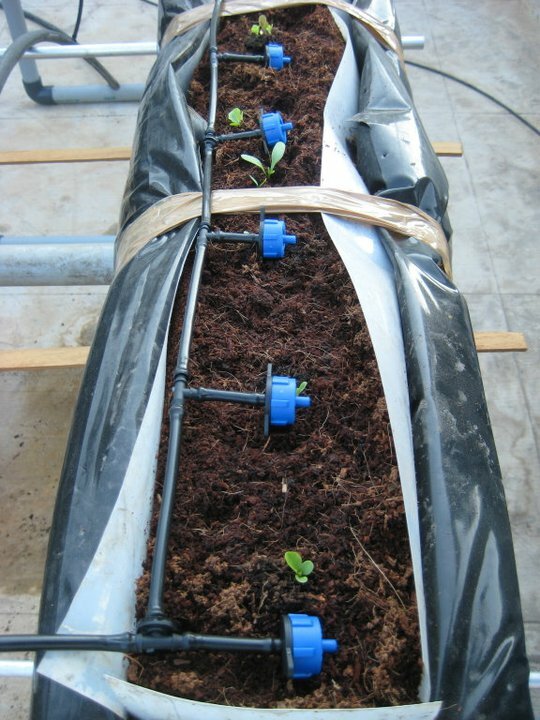 Once the little veggie saplings are planted, they need nutrients. The nutrient/fertilizer is concocted according to a very specific formula…..NPK (nitrogen, phosphorus and potassium), magnesium and calcium and a host of trace elements, are mixed together in water. (A small note here: even so called “organic veggies” in US markets, have NPK in their soil). 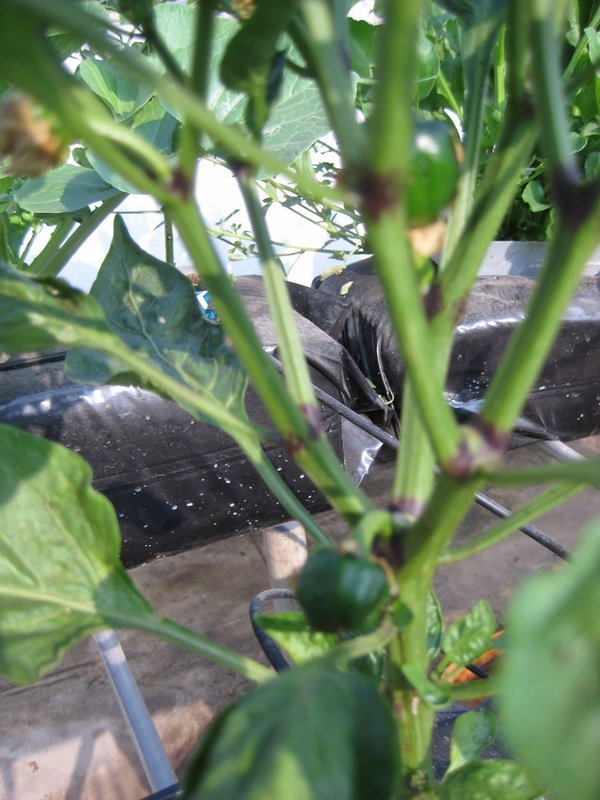 A huge plastic container holds this nutrient mixture, and the pump and timer feed it to the plants via the drip irrigation system at specific intervals. 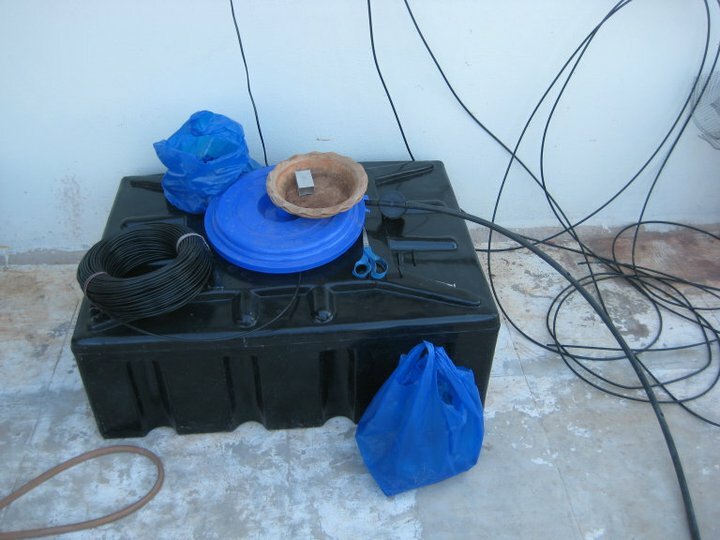 Here are some pics so you can understand better…. Of course, as with any new venture, we had successes and we had mishaps! My husband totally overestimated how many tomato plants we would need, so now we get about 2 kilos a day!!! I have been doling out to all and sundry, I have juiced and souped and jammed and jellied, my next step will be taking it to the veggie shop and selling it!!! 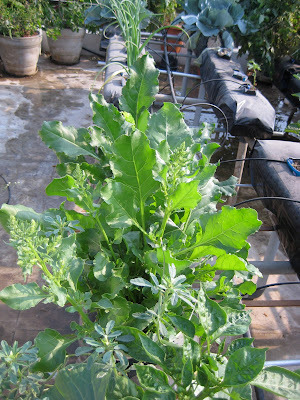 We planted too few lettuce plants, we should have staggered them, so now we have run out! 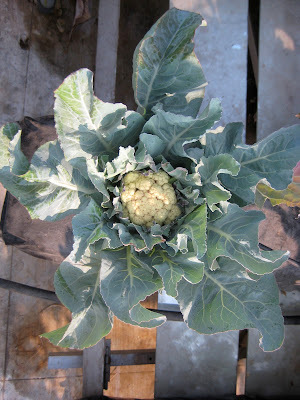 The cauliflower got waterlogged and rotted! We only have one good okra plant so I get 2 or 3 okras a week!! By the time I cut them and make okra fry, we get a mouthful each!! 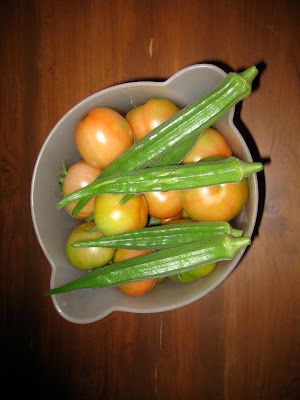 But nothing can beat the thrill of picking your own freshly grown veggies however tiny or measly it is. Its an indescribable feeling. Every morning I head upstairs and see what is ready to harvest – all I need is a straw hat and I’ll be like Ina Garten.. 🙂 We have a long long way to go before we are completely self sufficient, but its good to know that at least part of what I am putting in my mouth is organic and pesticide free! The last time I made this salad – pic below – it took less than 5 minutes for the lettuce to get from plant to table and the taste was amazingly fresh! I hope I have inspired you all to go organic! If you are lucky enough to live in Chennai or Bangalore or any other big city, you can get organic at the market. But if you still want to experience the thrill of growing your own vegetables hydroponically, e mail me (Kaminiandraga@gmail.com) and my husband and I will happily share info with you! And for those really interested, here is an inspiring read! Thank you Kamini, for sharing such an informative post on the Green Crusader. Thanks for this post Sudha. And kudos to Kamini. Fresh veggies from the garden is something to relish and to cherish. You're right…What an inspiring post! I have heard of coco-peat being exported for growing crops. Now that I have read this post, I have a better idea of how it is used. 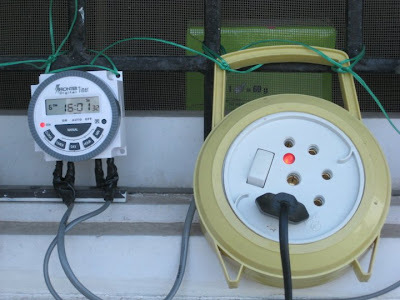 Thanks to Sudha and Kamini for this woderfully informative post. It is so nice to see all the green rooftop plants and freshly harvested veggies. Amazing work by your husband, and in a way I am not surprised for we all know he is real genius.It is really wonderful eating something from your own garden. A very big big thanks to Sudha..and to kamini as well and I am so overwhelmed about this idea and definitely going to get back to Kamini. Its a blessing to eat organic food.Lovely post.